While staying at the Rifflin'Hitch Lodge in Southern Labrador, you can enjoy your meals on the outside patio where you can overlook the Eagle River. This fine food entree of Foie Gras, some know it as Duck Liver, is smothered with a special sauce which was prepared by the gourmet chef for each guest. Foie Gras (Duck Liver) entree at Rifflin'Hitch Lodge, Eagle River, Southern Labrador, Labrador, Newfoundland Labrador, Canada. 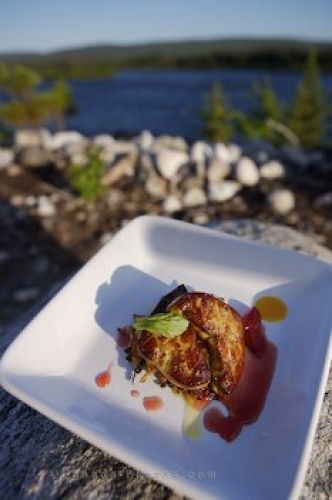 Picture of a food entree of Foie Gras or Duck Liver at the Rifflin'Hitch Lodge in Southern Labrador.